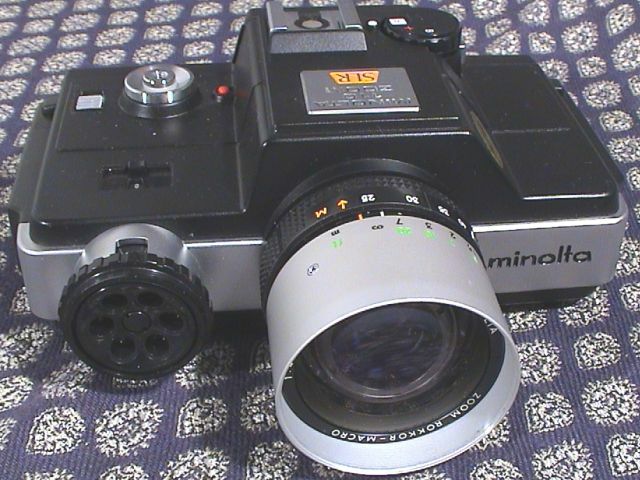 With Minolta's background in 16mm cameras it is not surprising that they offered a large range of relatively good 110 cameras. A more detailed breakdown is provided at The SubClub (http://www.subclub.org/shop/min110.htm). Only two models are outstanding in terms of the advancement of features for subminiature cameras and show what the more advanced and older format of Minolta 16mm cameras might have evolved into. The Minolta 110 Zoom SLR and 110 Zoom SLR Mark II are true single lens reflex cameras. The Mark I can easily be loaded with slit film and the Mark II has one of the best lens of subminiature cameras. In terms of subminiature cameras these are huge. This makes the Pentax Auto 110 even more remarkable for it's genuine subminiature size and indicates that the designers were not aware of the Narciss SLR which is a decade earlier, compact and made of metal. 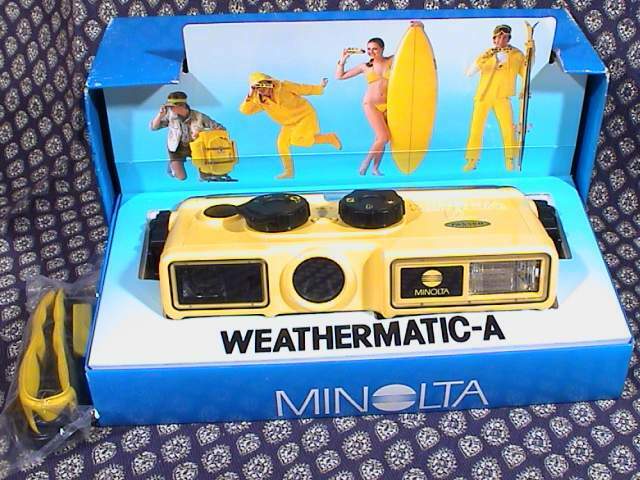 A special mention is given to the 1980 Weathermatic A although a conventional manual 110 camera with integral flash housed in a miniature submarine waterproof to 5 metres it has a 26mm f/3.5 zone-focusing (four elements in three groups) lens, focusing from 3 feet to infinity. Often described as the only waterproof 110, in fact it was merely the first - among others, Alfon and Hanimex, for example, also made waterproof 110's and others made water-resistant models. Introduced in 1976, this is the first 110 in an SLR design, and the second 110 camera with a zoom lens. The 25 - 50mm (f4.5-f16.0) zoom lens has close-focusing capability down to 11 inches. The camera is fully-automatic, aperture-priority exposure and the CdS meter has exposure compensation so that film fro ISO 25 to 1600 can be used and not only the default 100 and 400. Shutter speeds range from 10 seconds to 1/1000 second. X is flash at 1/150 second and there is a B setting, but otherwise no manual control. LEDs in the viewfinder give under and over exposure warnings as well as battery low status. The shutter release has a a thread for a cable release and can be locked from accidentally being pressed. Hot shoe for an Auto Electroflash 25, tripod socket on the side and fitments to attach the neck strap. The hood is detachable and folds back to fit inside the carry case. The camera can be reloaded with 16mm film, provided it is notched on the bottom edge. 40.5mm filter thread; UV, Yellow and 1B filters made by Minolta. Other accessories included a case with neck strap, lens shade, wrist strap, lens cap, and close-up lens kit. Uses two A76 batteries. 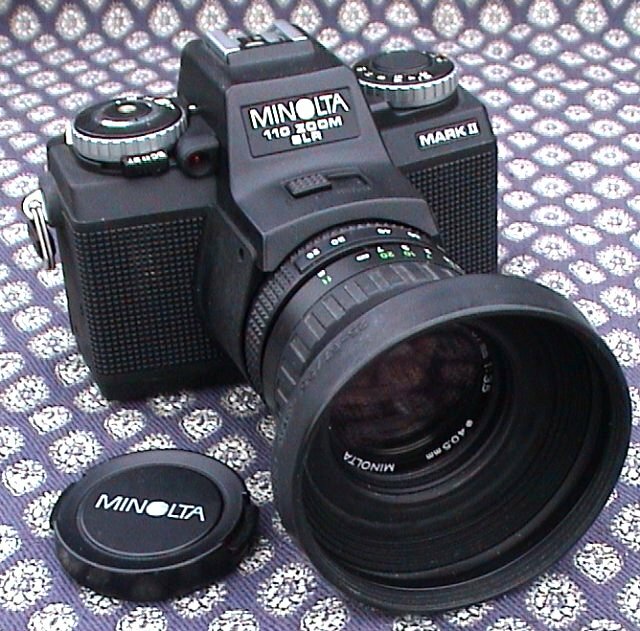 Launched in 1979 the Mark II resembles a small 35mm SLR. It had an original retail price for $342 making it complete with a large range quality cameras. The zoom is 25 to 67 mm (50-135mm in full frame 35mm) f3.5 12 elements in 10 groups plus a swing in close-up element focusing down to 8 inches. Aperture is fully variable with click stops at f3.5, 4, 5.6, 8, 11 and 16. Filter thread diameter is 40.5mm. Full-aperture TTL (through the lens) centre-weighed metering with exposure compensation control. Aperture-priority automatic from EV 5.6 to EV 17 (at ASA 100) with control for up to +/- 2 EV continuous adjustment in 1 EV steps. Shutter speeds of B (bulb), 1/4 - 1/1000 second, mechanical 'X' (1/125 second) for flash. The eye-level fixed pentaprism shows 85% of film frame area with split image focusing spot centred in mat field. Shutter speed is indicated by 5 LEDs, LED over-/under-range indicators and the LED at '125' also blinks as flash ready signal when Minolta X-series Auto Electroflashes are used. The viewfinder eye piece has correction from -1.1 to +0.8 dioptre. The shutter release has a thread for cable release and has a lock to prevent it being pressed accidentally. The self timer, with LED indicator, gives a 10 second delay. William White, in "Subminiature Photography", considers the lens on this model to be one of the top ten performers in subminiature history. Accessories include UV, yellow and 1B filers, a case, strap (with built-in battery holder), lens shade, action grip, lens cap, and AEF118X flash. Requires two A76 batteries. Introduced in 1980, the Weathermatic A is a rigged watertight camera with a built-in electronic flash unit capable of being used to depths of under 5 metres (15 feet). It has a 26mm f/3.5 lens, 4 coated glass elements in 3 groups with an angle of view of 45 degrees (34 degrees in water). Continuous focusing by a knob from 90 cm (3 feet) to infinity with 4 distance symbols (mountain, full-length portrait, head & shoulders portrait and close-up) and 1 central click stop (dot) with a guide embossed into the base of the camera. Fixed shutter of 1/200 second. Exposure control with click stops for sun, cloud and flash for successive use when finder lamp lights. Viewfinder has low-light/use flash warning and pulsates when flash has recycled and parallax correction for close up. Requires a single AA size battery for light sensor, finder lamp and flash operation. It can use ASA 100 or 400 film. The body is a bright yellow ABS plastic and floats, so it is easy to find if dropped. Optional accessories include sportsfinder, neckstrap, carry case and sports case with belt in bright yellow. 190 x 72 x 53 mm (7 1/2 (L) x 2 13/16 (W) x 2 1/6 (H) inches), 345g ( 12 3/16 oz).